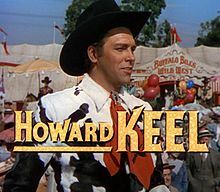 Howard Clifford Keel (April 13, 1919 – November 7, 2004) was an American actor and singer. He was born in Gillespie, Illinois. He starred in many movies, including Man of La Mancha and in Kiss Me, Kate. He died in Palm Desert, California from colon cancer. This page was last changed on 22 April 2019, at 16:41.